Cleansing wipes are your best friend when it comes to make-up removal while travelling because it alleviates the necessity to bring along liquidy make-up removing oil. It also spares some weight if you carry small packs. Scent: a strong grapefruit scent that radiates into the immediate surroundings; detectible in the room in which it's disposed in even hours later. Effectiveness: pretty good in terms of make-up removal but stings around the upper cheek and eye area. It definitely cannot be used to remove eye makeup because of irritation. After-effects: refreshed, clean face with subtle stinging sensations from the wipes. 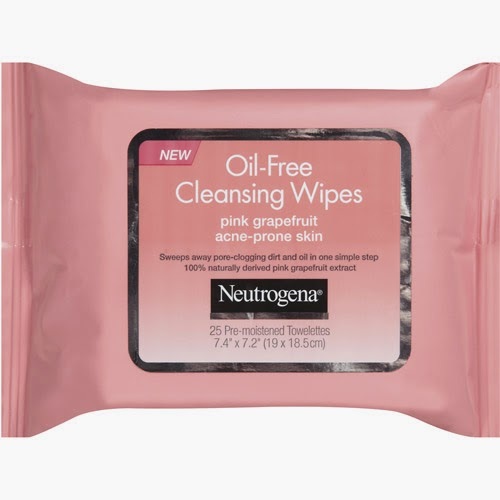 Comments: Unfortunately, the grapefruit variety of the Neutrogena cleansing wipes cannot be used to remove eye makeup, irritates sensitive areas of the face and emits a strong grapefruit scent that makes them unusable in public spaces where you actually need them (i.e. washrooms, airplane cabins etc.). The packaging says it's formulate for acne-prone skin; I'm unsure how this irritating stinging would provide relief for sensitive acne-prone skin at all. The price point is about $0.36 per sheet, which is quite pricey. Worst of all, I still have to bring my eye makeup remover bottle along... which totally beats the purpose of buying these wipes in the first place. I shall continue to use up the rest at home for lazy days and will not repurchase this variety in the future.